Cortijo el Puerto features the moon in the art of this gift set, as it serves as the symbol of their brand of olive oils. The moon also serves to represent this particular set of organic olive oils, each of which was produced from olives picked in different months during the harvest. Showcasing how the flavor profile of the coupage will evolve as the months change from October to November to December, this sets includes the green "Temprano" (early) coupage, the purple "Envero" (turning) coupage, and the black "Maduro" (ripe) coupage. During each specific harvest moment only olives in perfect condition are picked, and always at night to maintain low temperatures until the cold extraction can occur just hours later. These exceptional coupages come together from a selection of monovarietal oils carefully chosen to create a balanced mixture of flavor, color and smell. Temprano: This fruity blend of oil from green olives has flavors of freshly cut fresh green grass, wildflowers, apple, green almond, banana, vanilla, and green tomato. Moderate bitterness and pungency follow to balance the oil. The most powerful of the three, this coupage comes from olives harvested at their best during the month of October when the olive has got an intense green color. 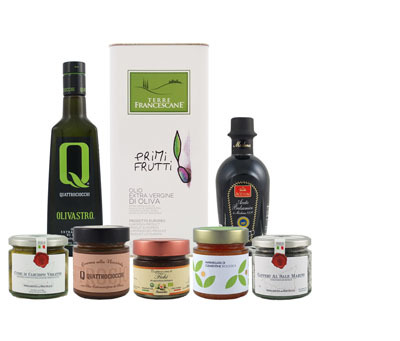 Excellent for vinaigrettes, cooked vegetables, fresh cheeses, mushrooms, pasta, poultry, white fish and seafood. Envero: This fruity oil has a floral aroma with notes of vanilla and ripe banana. For this coupage olive were harvested during the month of November when the olive has an intense purple color. Delicious with toasty bread and tomato, and recommended for Greek salads or drizzled over roasted vegetables. It also combines perfectly with cheeses, eggs, and yogurt. Maduro: This soft and fruity oil from ripe, black olives has aromas of wildflowers, apple, almond, banana, vanilla, tomato. On the palate the taste is sweet and balanced. Ideal for dressings and sauces, with green salads, cooked vegetables, and sautéed with mushrooms. Try it also with white fish.